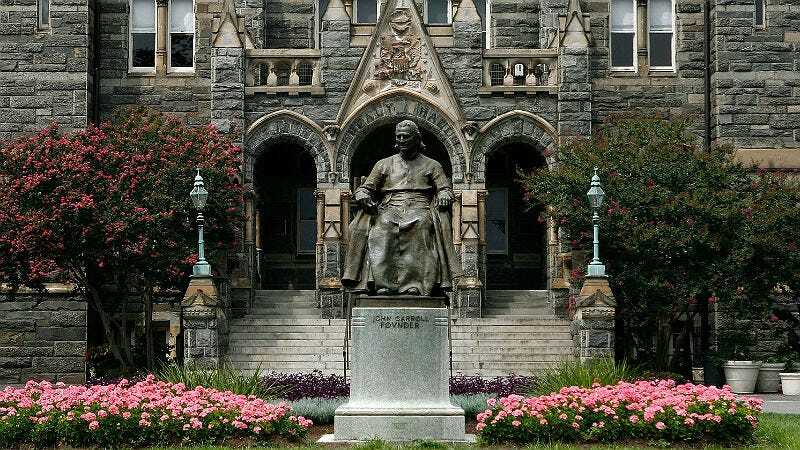 Did you know that two Georgetown University presidents sold Jesuit-owned slaves in the 1830s to pay down the school’s debt? Now the institution is renaming two buildings memorializing these men because of their slavery ties. Mulledy Hall and McScherry Hall, according to the Washington Post, will both be renamed Freedom Hall and Remembrance Hall, respectively, until permanent names are chosen. Mulledy Hall was a dorm named after president Thomas F. Mulledy, a Jesuit priest, who brokered the sale of 272 slaves to a Louisiana plantation owner in 1838. The sale was controversial at the time because some of the priests believed the slaves should be freed and others pushed for the slaves’ families to be sold together. Mulledy disregarded both requests. McSherry Hall is named after another university president, William McSherry, who also sold off Jesuit-owned slaves before Mulledy’s time and helped his successor in 1838’s sale. The renaming decision was announced via email from university President John J. DeGioia who said the idea came from a Working Group on Slavery, Memory and Reconciliation. The Group, made up of 16 students, administrators and faculty, was assembled in September after Georgetown students first called for the name changes in August. Now the students would like reparations for the slaves’s sale. … by establishing an endowment that, accounting for inflation, would match what the university made from the slave sale. The money, they said, should provide scholarships or a professorship based on race issues.